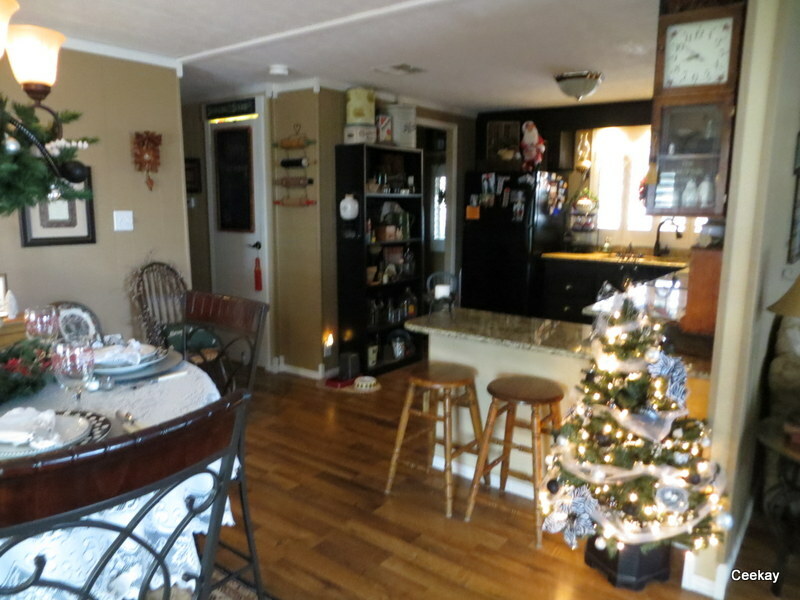 This home is a perfect example of manufactured home holiday decor paired with beautiful home updates. 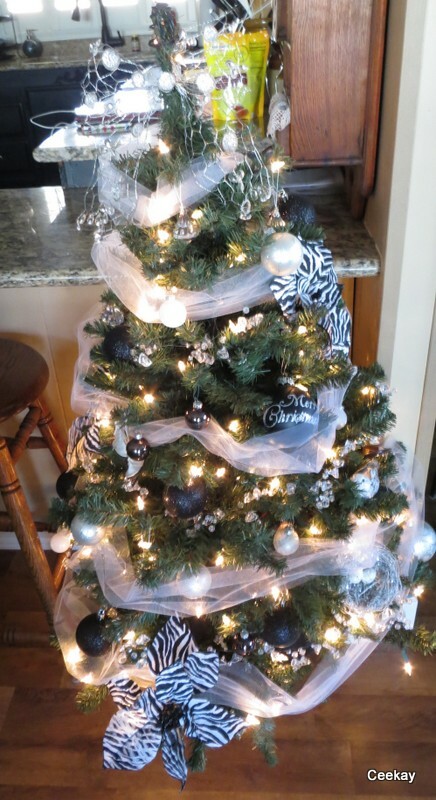 This gorgeous double wide is absolutely ready for Christmas! 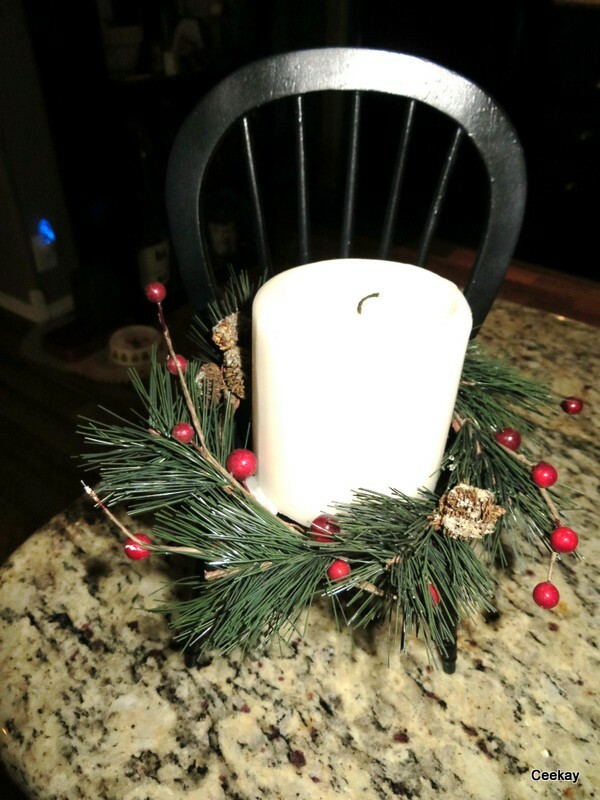 We’ll share the home before and after the homeowner’s updates first and then you can see the home decorated for the Holidays. 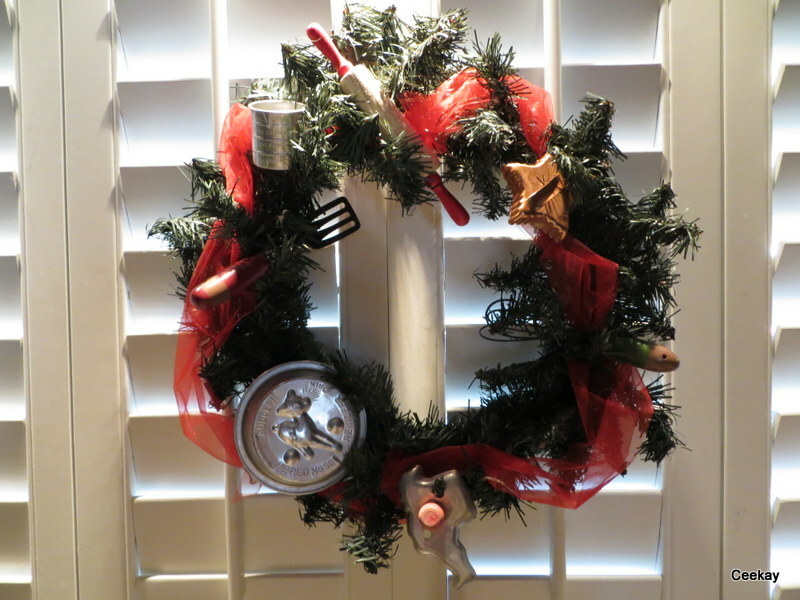 Ready to get festive? 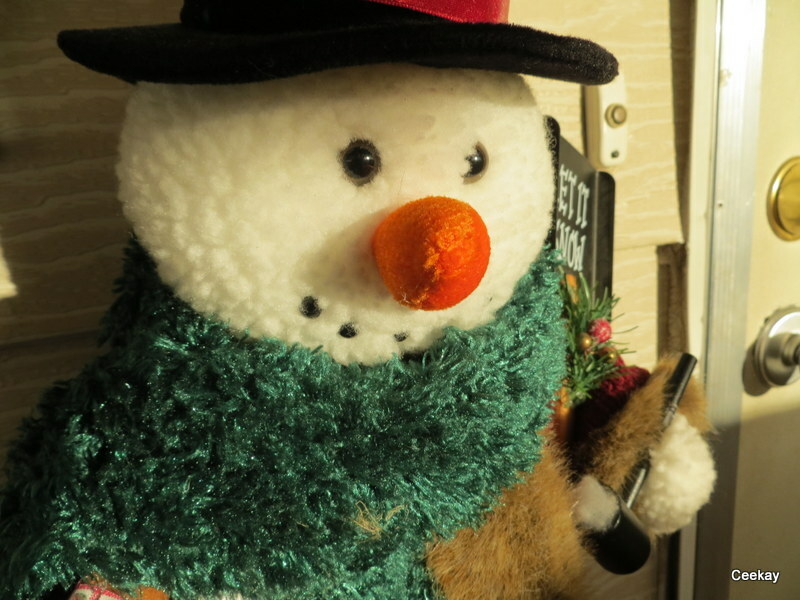 Vintage ornaments, feathered Christmas trees, happy snowman carolers and other holiday glitz decorate nearly every surface of this beautiful double wide in Mesa, Arizona. It’s only the homeowners, Ceekay and her husbands second Christmas in their new manufactured home, and it’s certainly being celebrated in style. This has been a busy year and a half for the couple. 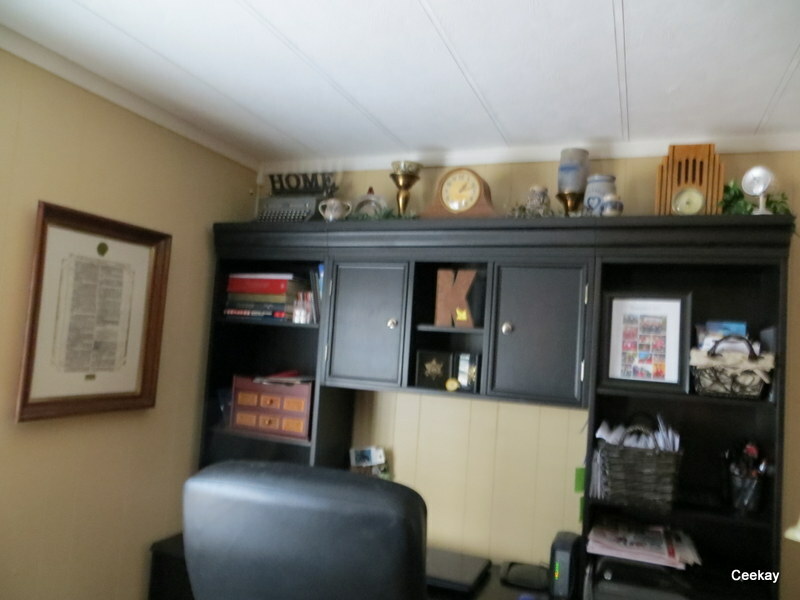 From the minute they decided to downsize from their larger site-built home into this double wide there has been near constant DIY projects going on. 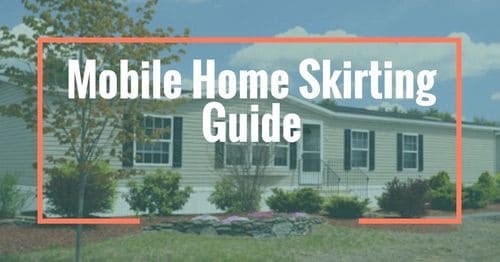 Ceekay is a popular blogger with a large following, and writes about her manufactured home decorating and improvements on her two blogs: Thinkin’ of Home and Double Wide Decor. She is also battling cancer and is a positive voice for cancer awareness. Her fierce fight along with her positive attitude is an inspiration to all. A double wide was not CeeKay’s ideal dream home. 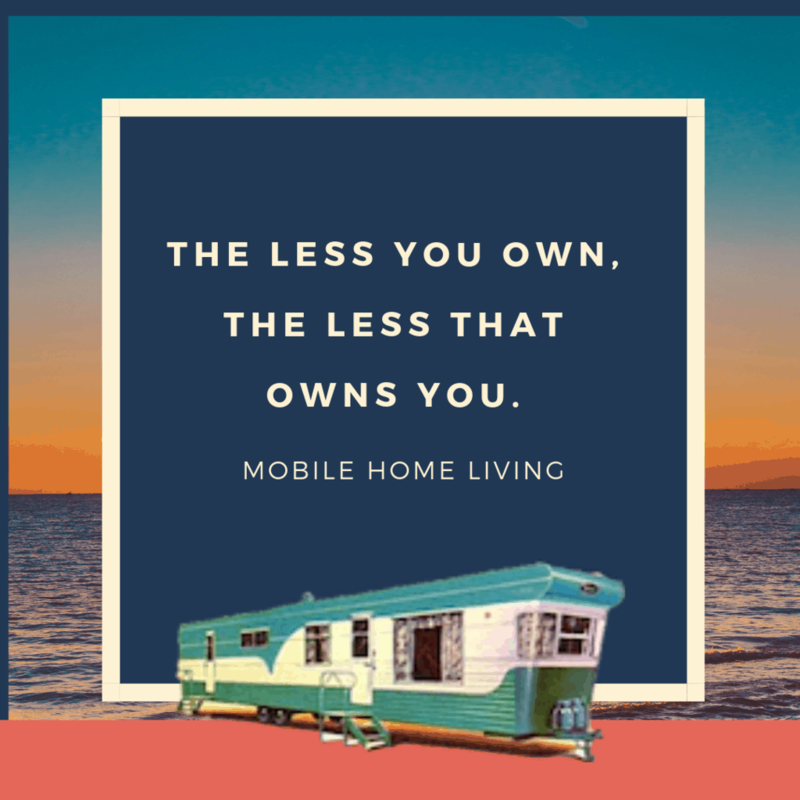 A manufactured home wasn’t something the couple had ever considered before, but when cancer struck and she was no longer able to work as a legal assistant, they made the tough, but logical, decision to sell their current house and pay cash for a smaller, more affordable home. 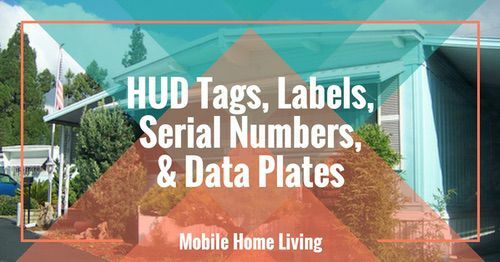 Downsizing is not easy and it’s especially not easy when you are used to living in a larger, more spacious home. However, CeeKay embraced the decision and absolutely made the best of it. 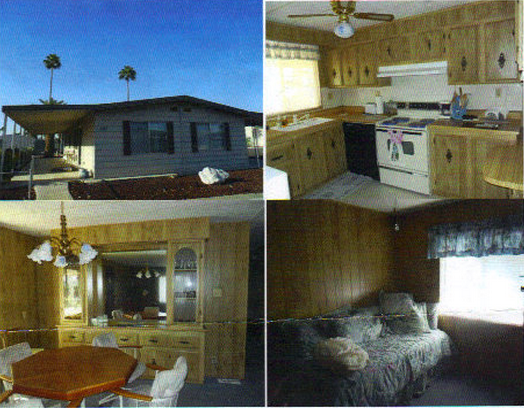 Several home improvement projects and beautiful manufactured home decorating transformed it into a beautiful home! 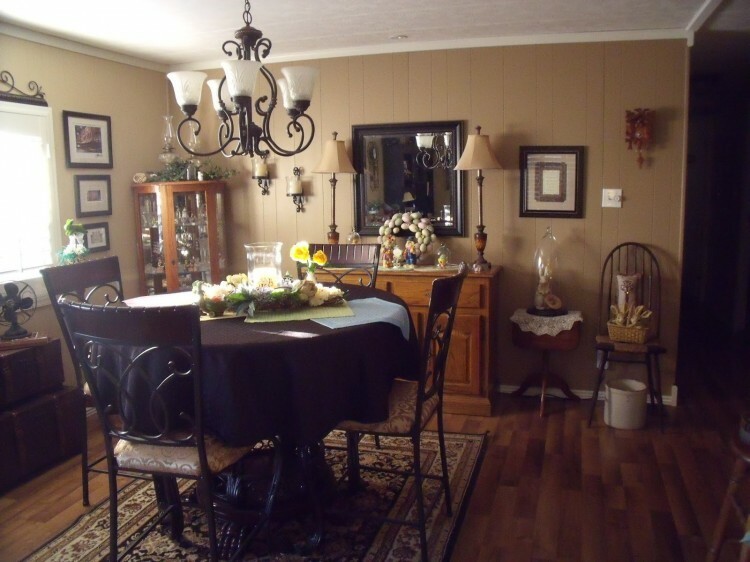 The home sits in a gated, 55+ community and had been well preserved. 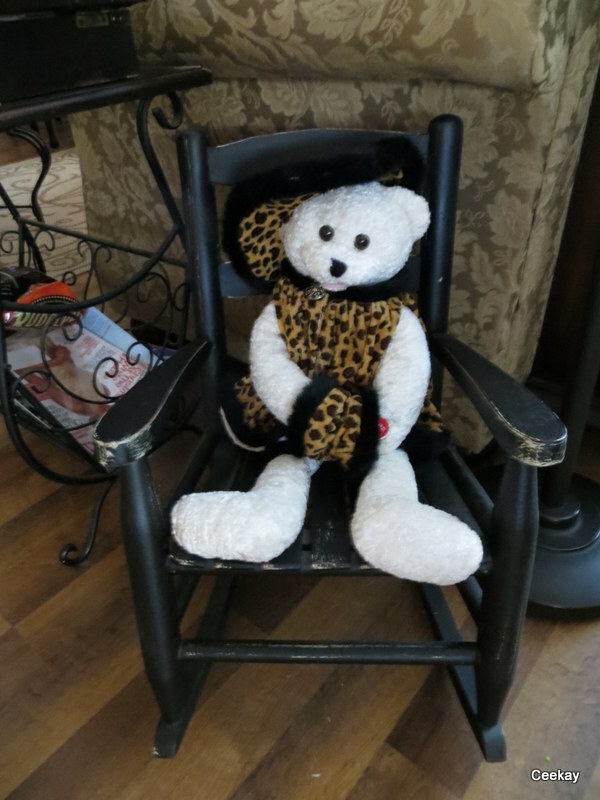 Few updates had been made to the interior style, though, so CeeKay and her husband quickly got to work making the changes. 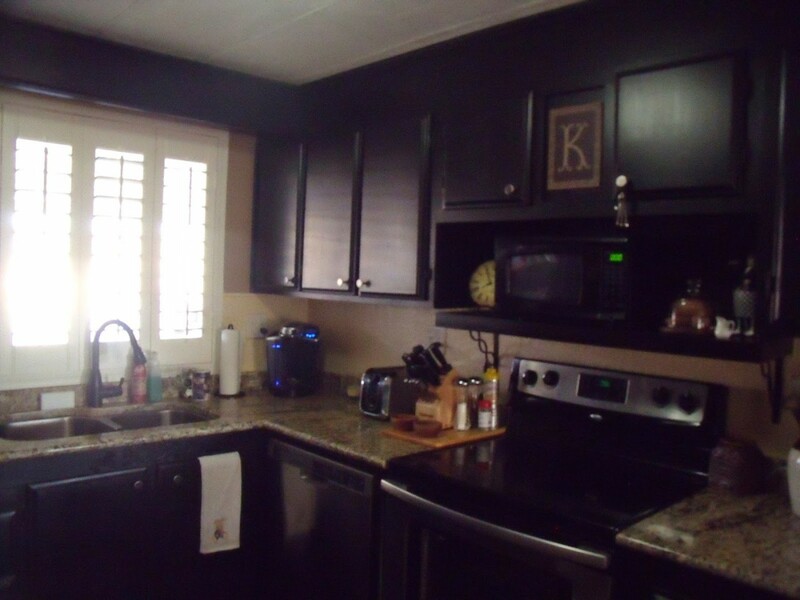 Painting kitchen cabinets are a great way to update a home. The use of black is very popular these days and goes with practically any style. Black is perfect for cabinetry because it hides smudges and fingerprints, too. 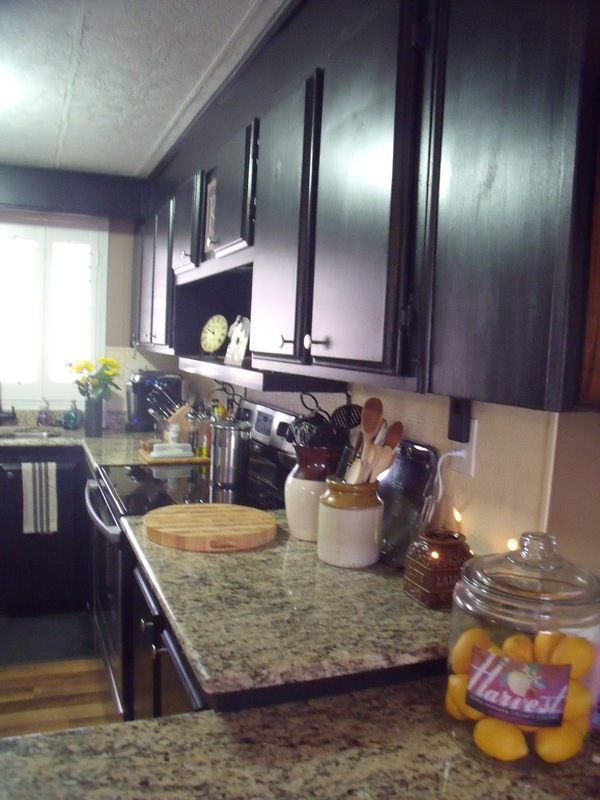 Granite counter tops are a great choice to make kitchens look more custom and high end. You can sometimes find affordable granite on Craigslist, which is exactly where CeeKay found hers! High-end doesn’t necessarily mean high-cost! The lovely living room has a sophisticated, world market style and is beautifully decorated in subtle tones and overstuffed furniture. It looks like a perfect place to snuggle up to a good book! As you can see in the photos, CeeKay is an avid antique collector and has a fine collection of furniture and decor. 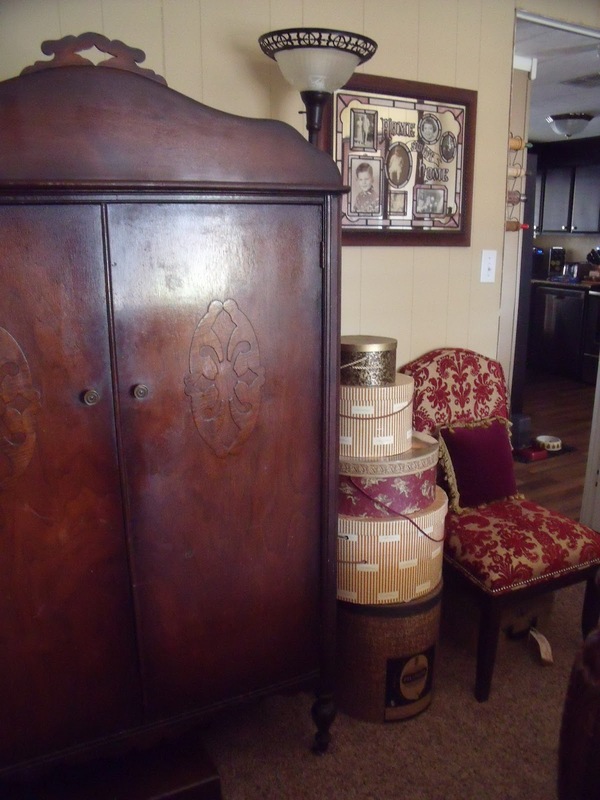 Some pieces are family heirlooms and some were found at estate and garage sales. 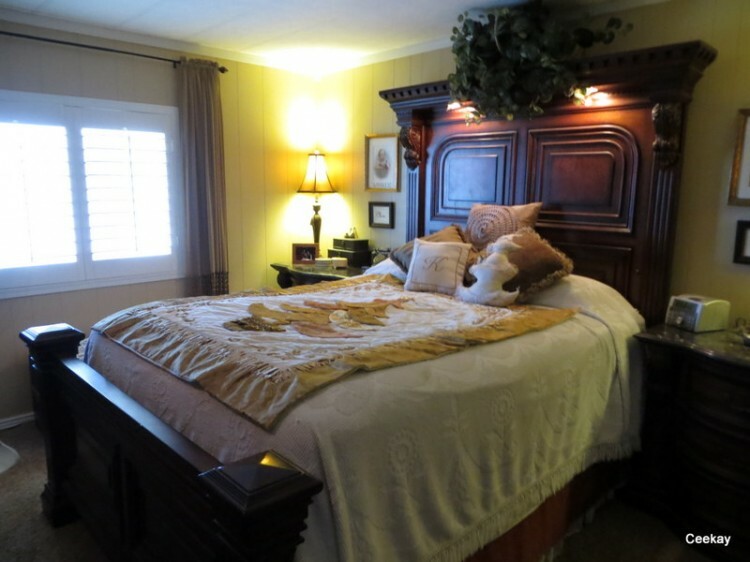 The bedroom in CeeKay’s home is amazing! The large headboard really makes a statement and gives the room an air of sophistication. A whimsical collection of antique washing boards and baby clothes are a perfect match for a laundry room! 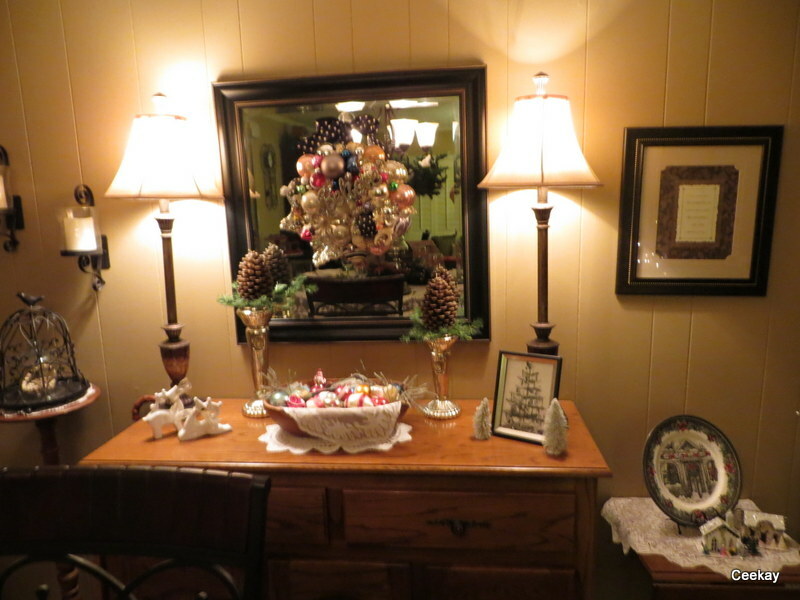 CeeKay has been kind enough to let us see her beautiful manufactured home holiday decor as well! 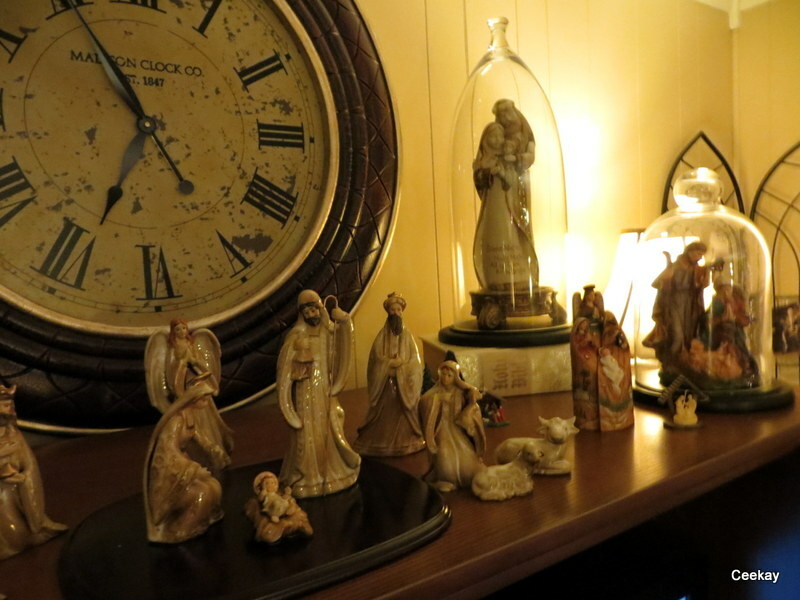 Her home is a place where the Christmas spirit shines. 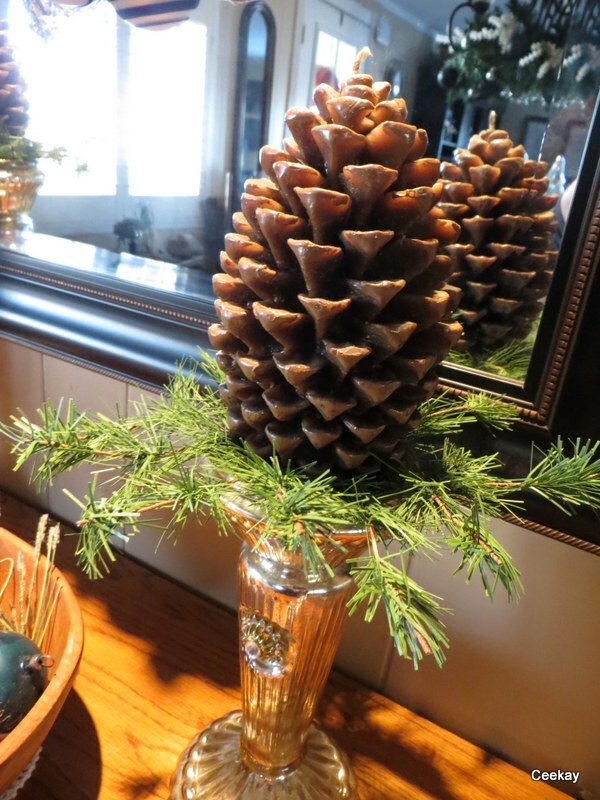 Here’s a photo tour of her home decorated so beautifully for the Holidays! 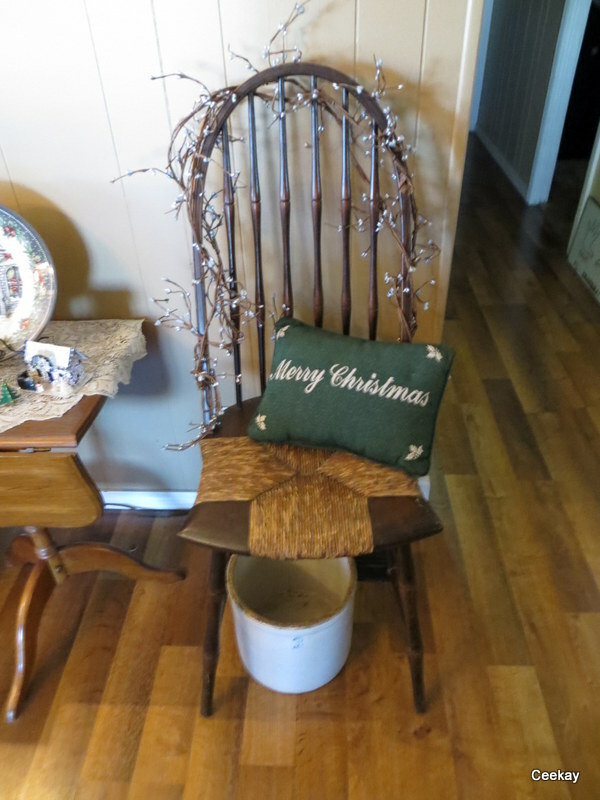 Add Christmas pillows for a festive touch. 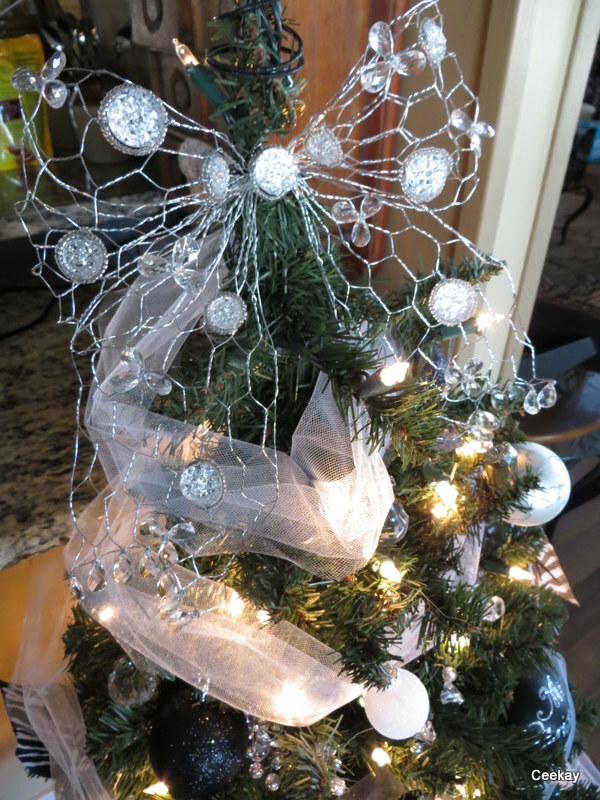 Small details often make the largest impact when it comes to manufactured home holiday decor. 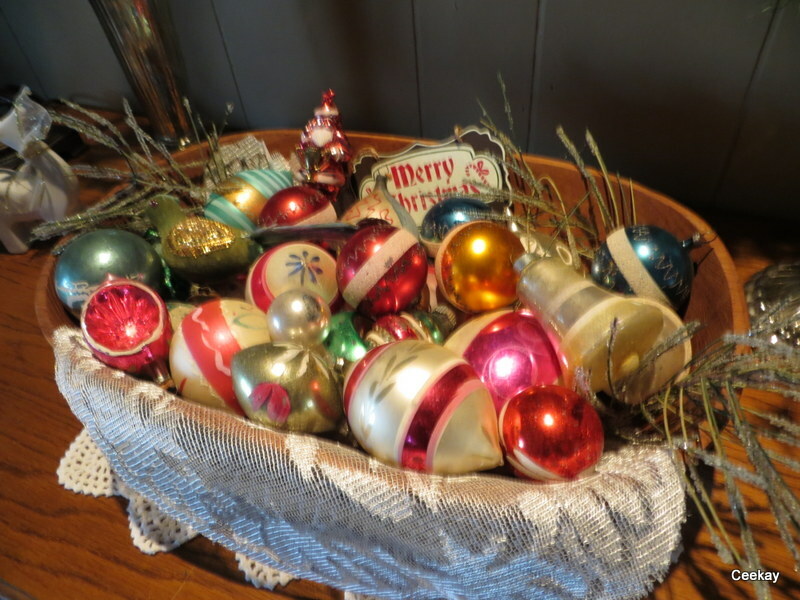 Manufactured home holiday decor can be as sophisticated or simple as you want. 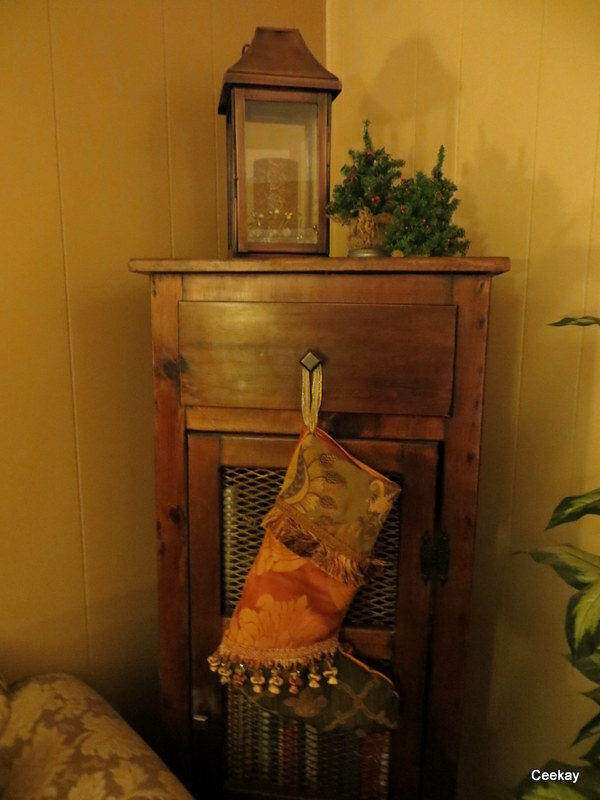 CeeKay manages to add beautiful smaller displays throughout her home to give it a cohesive, cozy charm. 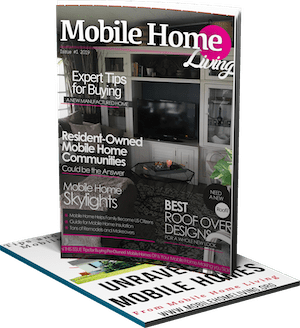 Thank you, for reading Mobile and Manufactured Home Living! 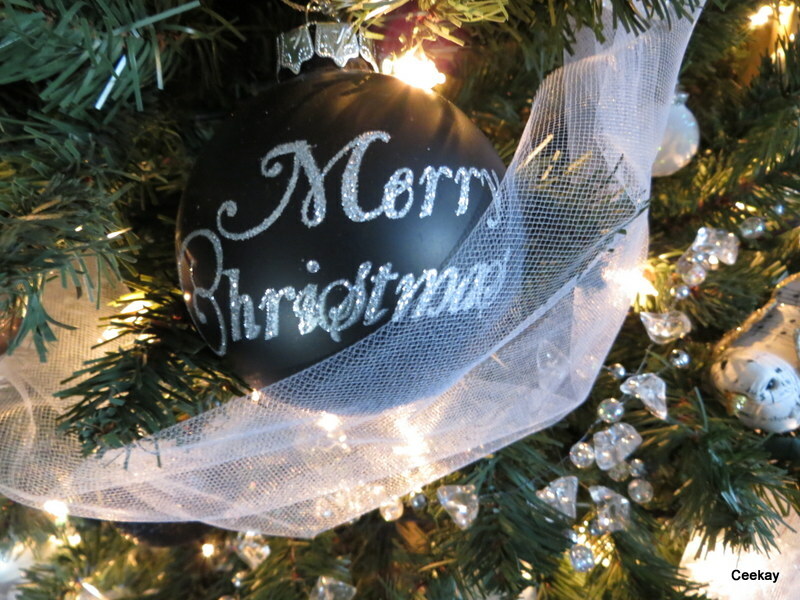 May you have a wonderful Holiday and Merry, Merry Christmas! Happy Holidays Crystal! 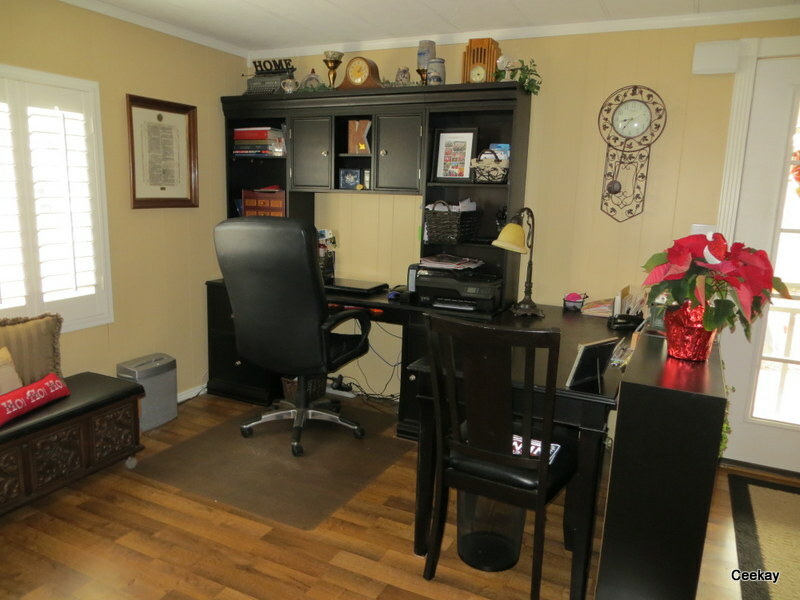 I love your site & have enjoyed all the valuable information that you work so hard to provide. 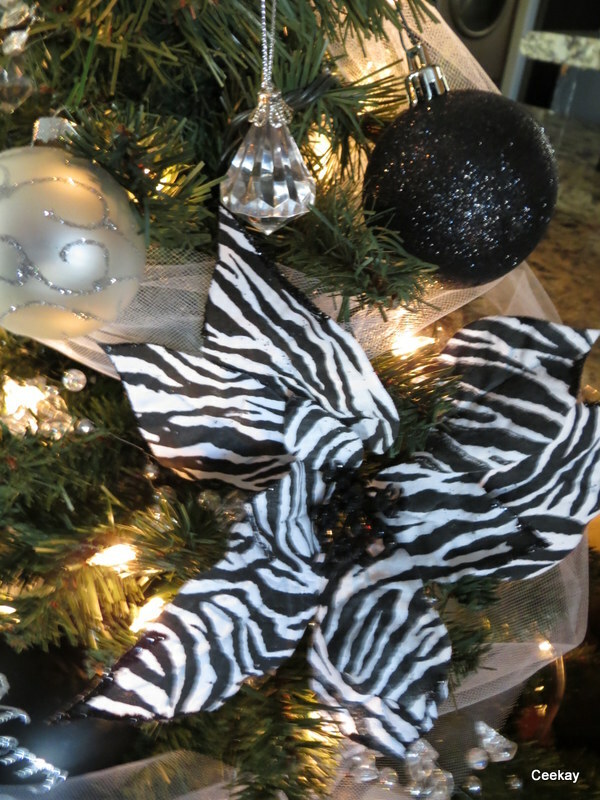 Love holiday decorating. 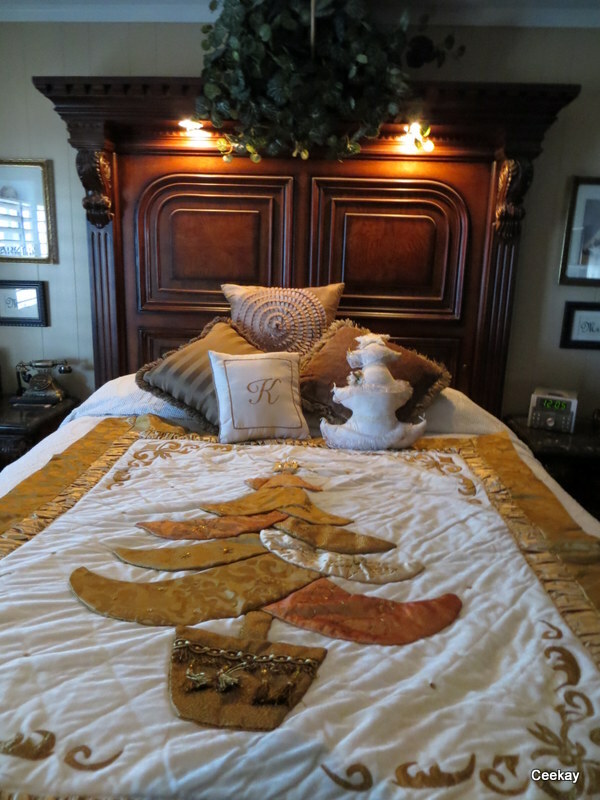 I noticed in your feature of Ceekay’s beautifully decorated holiday home you refer to her battle with cancer. Ceekay passed away in September 2015. Not sure if you knew. I loved her blogs as well. Her creativity and attention to detail continues to inspire so many. I hate to hear that about CeeKay. I’m not sure if I should remove the post or not, or mention that she has passed, so I’ve left it exactly how she approved it. I want her beautiful home to be seen but I don’t want to be rude. Any suggestions are appreciated. Hi Crystal. Just my opinion, I think that leaving Ceekay’s holiday post would be a lovely tribute to her! It would be a shame to change it since it honors her creativity & design. If you want, you could mention that she passed away. Please consider leaving it because what would the world be like if we stopped enjoying the work of artists, decorators, authors, & other inspiring people who are no longer here? 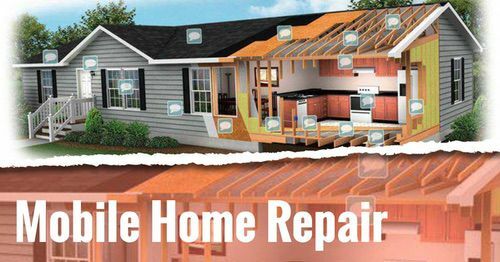 Again, thank you so much for all you do to provide us with valuable information about our homes. Thank you, Carol. I appreciate the suggestion. I will leave it and just add a small note. She was so talented at making a house a home and should be honored. Crystal, my friend, this one brought me to tears. The remodel was beautiful! I know, with my own, even now, not finished, I get lots of comments on what a great job I’ve done. I’m very proud of that! 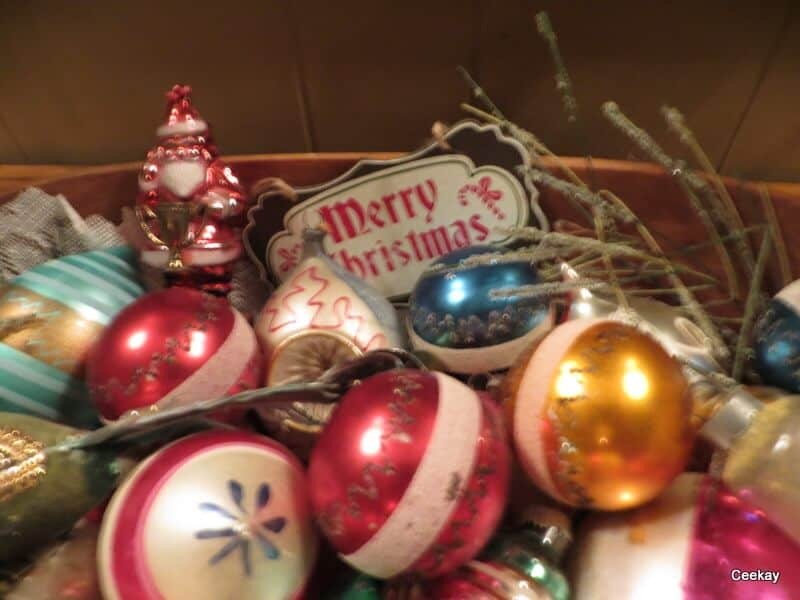 Have been going through all the Christmas decorations we’ve stashed away since our house fire seven years ago. I had no idea how much there was! 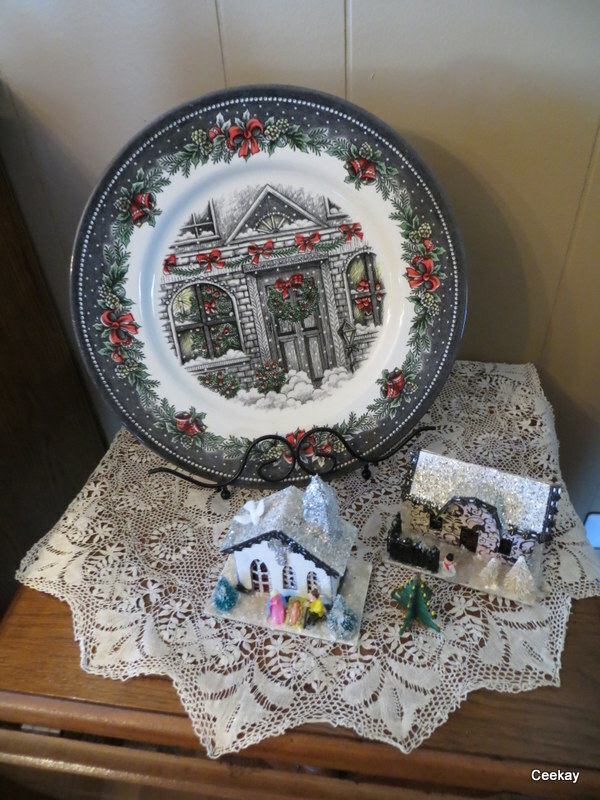 My kids and grandkids are coming here for Christmas this year and I wanted to decorate the place. 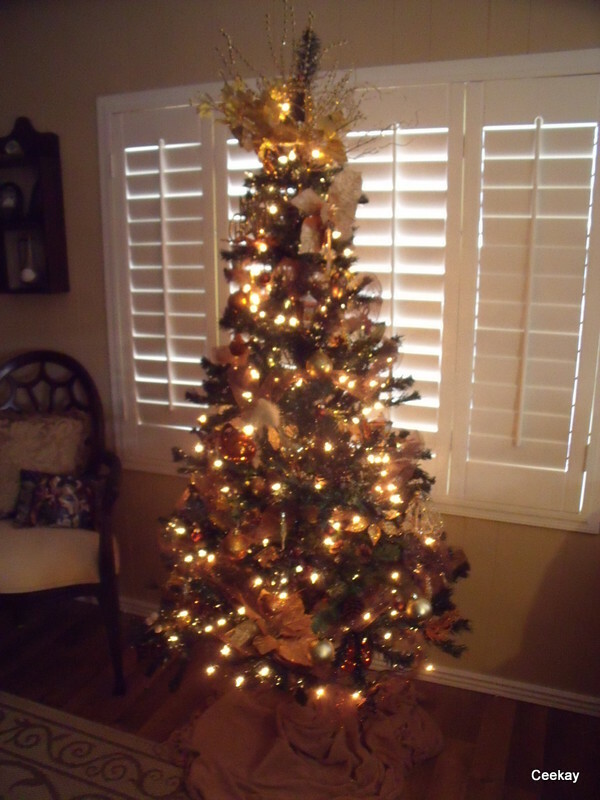 For the first time in 17 years, I’m putting up a tree! 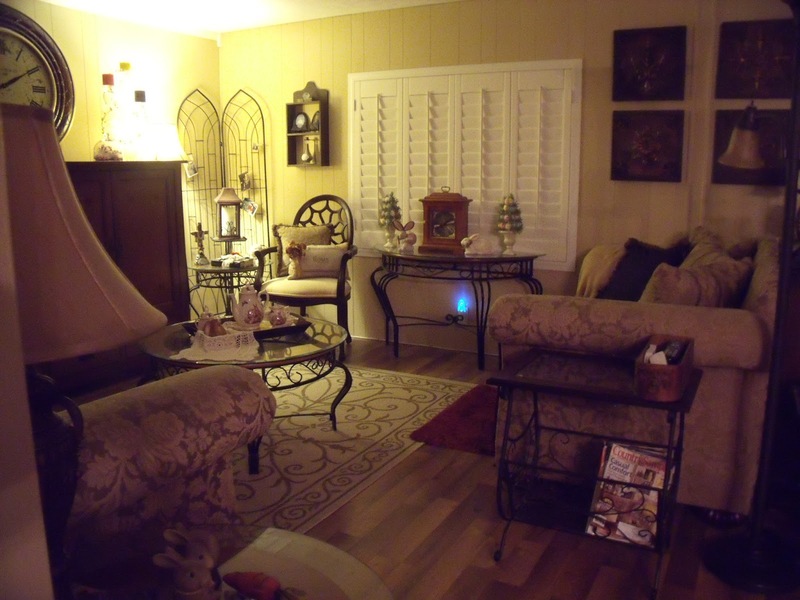 Ceekays decorated home gave me some great ideas! Prayers to her family over the holidays without their loved one! I just found this site & am so excited !! thank you for what you do ! Awesome! Glad you found us Phyllis! Hope to hear from you lots more! My thoughts and prayers are with her family at this time. Ceekay passed away this September after a battle with cancer. She had a beautiful home and will be greatly missed. 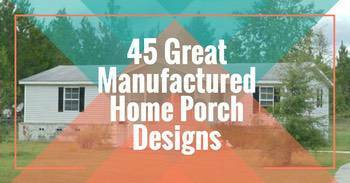 I love your house — your style is very similar to mine so I adore everything you’ve done! 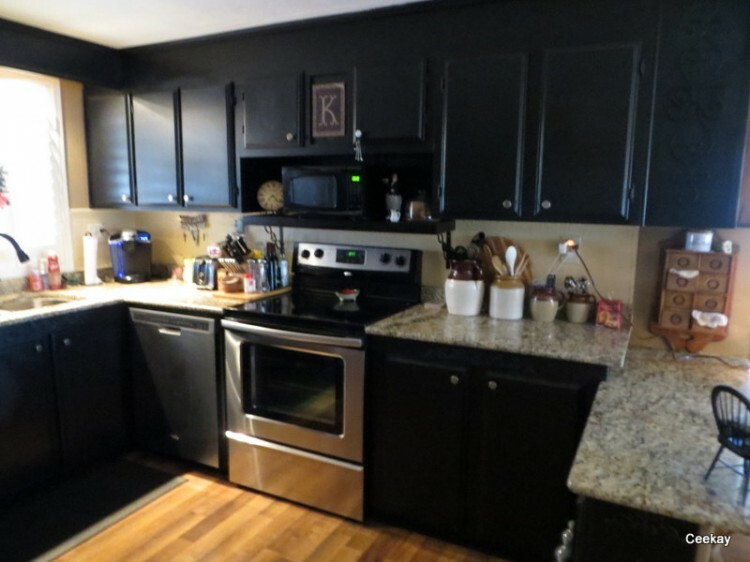 Are the kitchen cabinets solid wood throughout? 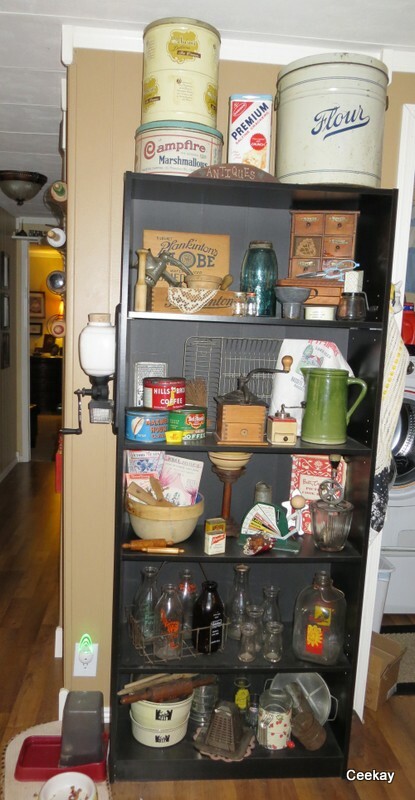 I would love to paint mine, but my cabinet boxes are that stick on vinyl — only my doors are solid oak. 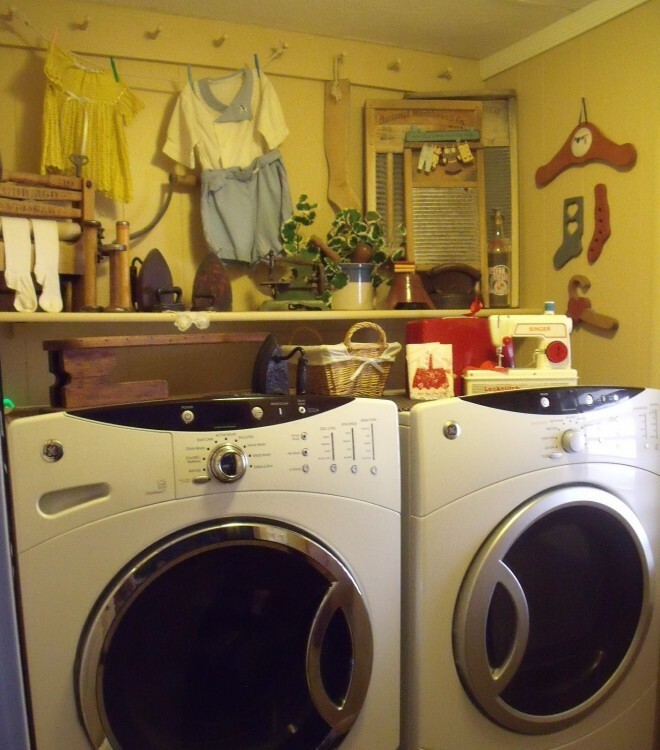 I really loved the laundry room ideas. I just cant seem to get my husband in the movement to finish his starting of his jobs. I have started painting my kitchen cabinets I love the look. 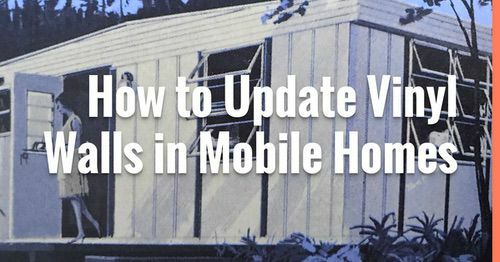 Love your home and I would like to see more about selling and buying a used mobile home. State of Illinois has some really strange laws. Hi Debbie!! CeeKay’s home is gorgeous and I, too, especially loved the laundry room. It’s so creative! We can never seem to get our projects finished. We have no problem starting most of them but we just never seem to completely finish them at all..lol. It’s so hard for someone to work full time and then want to come home and work even more. It will eventually all work out and maybe our homes will be as beautiful as CeeKays..fingers crossed for us! Very pretty. I’m a “white kitchen” fan myself, but I love the rest of the home. Great job! I like white kitchens, too, and painted mine a bright white but I think I’m going to try to go with a charcoal or darker grey, like CeeKay’s, on the bottom cabinets. I just can’t keep the bottom cabinets clean at all. Ceekay’s home is gorgeous and I’m so appreciative of her letting me feature her home. Thanks for commenting! Just beautiful, gives me hope for my double wide. You have done a beautiful job with the decorations! I love antiques too and you have some lovely pieces. 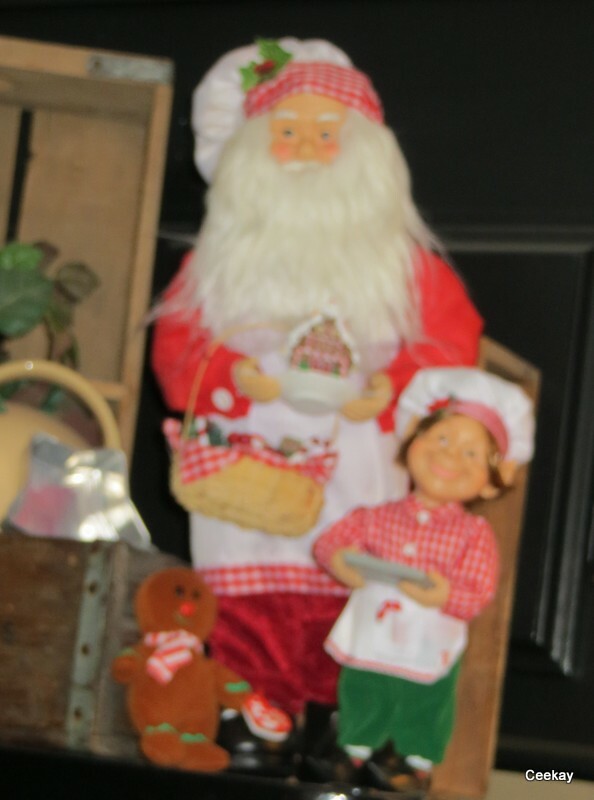 Thank you for sharing this lovely home with us and have a very Merry Christmas and Happy New Year!